Two-Slice Toaster Just $32.99! Down From $68! PLUS FREE Shipping! You are here: Home / Great Deals / Amazon Deals / Two-Slice Toaster Just $32.99! Down From $68! PLUS FREE Shipping! At Amazon, you can get this Two-Slice Toaster for just $32.99 down from $68 PLUS FREE shipping! Housed in brushed and chrome stainless steel, this high-quality KRUPS toaster not only looks good on the counter, but it also toasts bread to perfection—up to two slices at a time. The unit’s extra-large, self-centering slots (1.5 inches wide by 5.75 inches long) can accommodate a variety of items, including bagels, buns, English muffins, and thick slices of homemade bread. 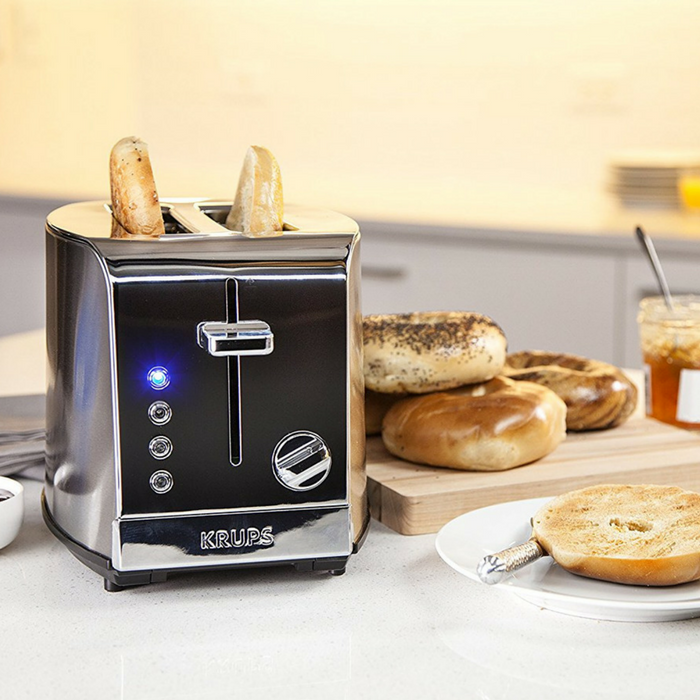 Choose bagel mode for warming the outside and toasting the cut side of bagels; defrost mode for toasting items like frozen waffles, toaster pastries, or toaster hash browns; reheat mode for warming without toasting; or the cancel function to end the session at any time. You just have to turn the knob to select one of the six browning settings, from light to dark. Other highlights include blue LED indicators, a high-lift lever for smaller items, two removable crumb trays for easy cleaning, and cord storage to help keep countertops looking tidy.